Kaboo Casino is designed with a sci-fi universe as its background. Here, gamers can complete their missions to earn Echoes, which is the casino’s currency. It features a series of games from Microgaming, NetEnt, Play’n GO, Elk Studios, Thunderkick, NextGen Gaming, Evolution and Yggdrasil. These can be played virtually on any computer, tablet or smartphone. This unique casino is duly licensed by the authorities of UK and Malta. There are a whole host of casinos doing their trade on the internet with the same types of games as well as promotions, so it is not very easy to be different from others. 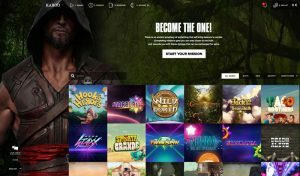 Kaboo Casino found a way out of this problem by being entirely different from all the other casinos by designing an online gaming website that really stands out. They did this by creating a background with a space theme, filled with the mysteries of probability. Most of the gam es provided by the Kaboo Casino are slots, featuring diverse titles from many of the foremost platforms that include many original as well as favorite slots such as Hook’s Heroes, Starburst, Guns N’ Roses, Jack and the Beanstalk, Dazzle Me, so on and so forth. Although this famous casino has its focus primarily on slots, you can also choose a game from a whole host of table games. Blackjack enthusiasts will be delighted to learn that Kaboo Casino offers an extensive collection of blackjack games like Blackjack Gold, Blackjack Double Exposure, Premier Blackjack, and many more. Apart from these, this great casino also features several Roulette and Poker variants. Casino also features other types of games that are filled with scratchers and other special games including Foamy Fortunes, Hole in One, Samba Bingo Max Damage, The Alien Attack and more. The Kaboo Casino has come up with the most remarkable and highly original bonus system in the casino history. Echoes is the bonus token that you can freely exchange for freespins. This versatile casino is flexible in your choice of the slot game that you choose the freespins to be, although different games need different number of Echoes for a specific amount of Free Spins. As soon as you register yourself with the casino, you get a welcome bonus of five echoes absolutely free. With your second deposit, you will get a 100 percent bonus with a maximum of €100 and 50 echoes. Kaboo Casino wants to satisfy their mobile players also. You can play using your tablets and smartphones that includes the iPad, iPhone, and all Android devices. In fact, it is extremely easy to navigate the online site to access the content without experiencing any problems and hence you can play the casino, wherever you go. With Kaboo Casino, you can deposit and withdraw cash with safety and security by different payment methods. You can choose MasterCard, Visa, Neteller and Skrill and world’s major currencies. Kaboo Casino offers excellent customer service to their players around the clock, in English, Finnish, Norwegian and Swedish, in the form of live chat, telephone or email.